Presented here is a representative of each model of Jaguar racing car campaigned by the factory or in private hands. Also presented, are notable Jaguar powered racing cars. 1950 XK120S: Peter Whitehead and John Marshall drove this car at Le Mans to 15th place in 1950. This was Jaguar's first attempt at Le Mans and three cars were entered by privateers, all basically production cars, modified and supported by Jaguar. Brake problems kept the entries from finishing well, but the potential was recognized! Model by BRUMM 1/43 1950 XK120S: Nick Haines and Peter Clark drove this highly modified XK120 entered by Clark (on behalf of Jaguar) at Le Mans in 1950. The duo finished 12th in Jaguar's maiden venture at Le Mans. The success convinced William Lyons that Jaguar needed to attack Le Mans with its own team, which they did, winning the race the next year in the C-Type. Model by SPARK 1/43 1950 XK120S: The third works prepared XK120S that ran at Le Mans in 1950, this car was owned and entered by Leslie Johnson. It was driven by Johnson and Bert Hadley, retiring in the 21st hour due to clutch problems. The car was in third place with a second place looking imminent when the clutch center gave way. A disappointing end to a promising beginning. 1950 XK120: NUB 120 was well driven by Ian and Pat Appleyard to 1st place in the 1950 Alpine, 1951 Tulip, Alpine & RAC rallies. Pat Appleyard was the daughter of Jaguar founder, Sir William Lyons. Not a bad guy to have as your father-in-law! This milestione car is preserved today in the Jaguar Daimler Heritage Trust collection. Model by CORGI 1/43 1950 XK120: January in Florida is a great place to be for the warm weather and the weather is also great for racing. Before there was Daytona, there was the New Year's race at Palm Beach. Briggs Cunningham entered one of the five XK120's that raced at Palm Beach in 1950. Driven by Sam Collier, the car placed 6th, behind Leslie Johnson's XK120 in 4th place. 1951 XK120-C (C-Type) (LE MANS WINNER): Driven by Peter Walker and Peter Whitehead to Jaguar's first Le Mans victory in the 1951 race. The heart of the tubular chassis and aluminum skinned C-Type is the 3.4L twin-cam, straight-6 engine, tuned to produce around 205 bhp. Model by HISTORIC REPLICARS 1/24 1951 XK120-C (C-Type): Clemente Biondetti and Leslie Johnson retired on the 50th lap due to oil pump failure, the same problem that would claim the Moss/Fairman car a little over 40 laps later. Model by BRUMM 1/43 1951 XK120-C (C-Type): Stirling Moss set fastest lap at Le Mans in 1951 at an average speed of just over 105 mph. Moss was paired with Jack Fairman, however their car succumbed to engine failure on the 92nd lap. 1951 XK120-C (C-Type): Stirling Moss drove to victory in the 1951 Dundrod Tourist Trophy race at an average race speed of 83.55 mph on the Ulster circuit. It was a Jaguar 1-2-3 finish and the second consecutive win for Jaguar in N. Ireland on the demanding Dundrod TT. Moss set a lap record of 5 min. 22 sec. Model by K&R Replicas 1/43 1952 XK120-C (C-Type): Stirling Moss drove again for Jaguar at Le Mans in 1952, teamed with another Peter, this year Peter Walker. Jaguar embarked on trying to make the C-Type faster on the long Mulsane Straight by making the car more streamlined. The reduced airflow through the radiators caused the engines to overheat and expire, with the Moss/Walker car out in the third hour. 1953 XK120 Record Car: Capitalizing on records set with the XK120 in 1949, Jaguar again went to the continent and ran on the Jabbeke straight stretch of the Belgian motorway. Jaguar test driver Norman Dewis achieved a top speed of 172.412 mph in the flying mile (two runs) in this car and set another record for Jaguar. 1953 XK120-C (C-Type): What better way to spend several days in November than on a 1,900 mile road race through Mexico? This car (XKC029) was raced on the Carrera Panamericana twice (1953 & 54), where unfortunately it failed to finish both times. Driven by owner Francisco Ibarra, this is the car in its 1954 race livery. Co-driver was Fernando Pinal. This Mexican entry retired early with an oil leak. Model by TOP MODEL 1/43 1953 XK120-C (C-Type): Finishing 4th at Le Mans in 1953, Peter Whitehead and Ian Stewart almost made it a hat trick for Jaguar. The introduction of disc brakes proved the difference over more powerful competition. Model by BRUMM 1/43 1953 XK120-C (C-Type): Stirling Moss and Peter Walker finished 2nd at Le Mans a lap ahead of the 3rd place Cunningham. Moss had great success in the C-Type, winning the Dundrod TT in 1951 & 1st in class in 1953. 1953 XK120-C (C-Type) (LE MANS WINNER): After a disappointing race in 1952, Jaguar's second Le Mans victory came as a result of the efforts of Tony Rolt and Duncan Hamilton in this car in the 1953 race. They finished with an average speed of 105.85 mph. Model by AUTOART 1/43 1953 XK120-C (C-Type): Jaguar finished 1st and 2nd at Le Mans in 1953. The last Le Mans outing for a C-Type was in 1954 when the French entry finished 4th. Model by AUTOART 1/18 1953 XK120-C (C-Type): Later C-Types such as this one were more powerful than the earlier cars, using triple twin-choke Weber carburetors and high-lift camshaft. They were also lighter and better braked, by means of all-round disc brakes. 1953 XK120-C (C-Type): Ecurie Ecosse purchased the Jaguar team cars from the 1953 season and raced them extensively in 1954. This car (XKC053) finished second at Le Mans in 1953. It was raced at the Spanish GP support race for sports cars and finished 3rd with Ninan Sanderson at the wheel. Model by K&R REPLICAS/SMTS 1/43 1953 XK120-C (C-Type): This car (XKC052) was raced by Roy Salvadori at the Spanish GP race at Barcelona, narrowly being beaten by Ferrari. At Le Mans in 1953, this car finished 4th and had a long, successful race history. Model by K&R REPLICAS/SMTS 1/43 1953 XK120-C (C-Type): James Scott Douglas was unable to start the Spanish GP race due to engine problems. Engine problems did not prevent XKC051 from winning Le Mans in 1953, its most glorious racing moment. 1953 XK120-C (C-Type): Roy Salvadori won at Goodwood in 1954 driving this Ecurie Ecosse C-Type. Salvadori was one of the great all-round drivers of his era. He competed in F1, co-drove the winning Aston at Le Mans in 1959 and had a successful career in saloon car racing. Model by JAGUAR MODEL CLUB 1/43 1953 XK120-C (C-Type): This C-Type (XKC502) started life as a Jaguar team car at Le Mans in 1953, where it finished 4th in the hands of Peter Whitehead and Ian Stewart. It was sold to Ecurie Ecosse for the 1954 season and was one the team C-Types driven throughout that 1954 season by the Scottish team. It was paired with team car of Roy Salvadori's for the Goodwood International in 1954, finishing 4th driven by Desmond Titterington. The car was sunsequently sold by Ecosse as they graduated to D-Types in 1955 to Peter Blond who raced it with success until the end of the 1956 season. Models by AUTOART 1/43, 1/32, 1/18 1953 XK120-C (C-Type): The C-Type was produced from 1951-53 and 54 cars were made for factory and customer teams. 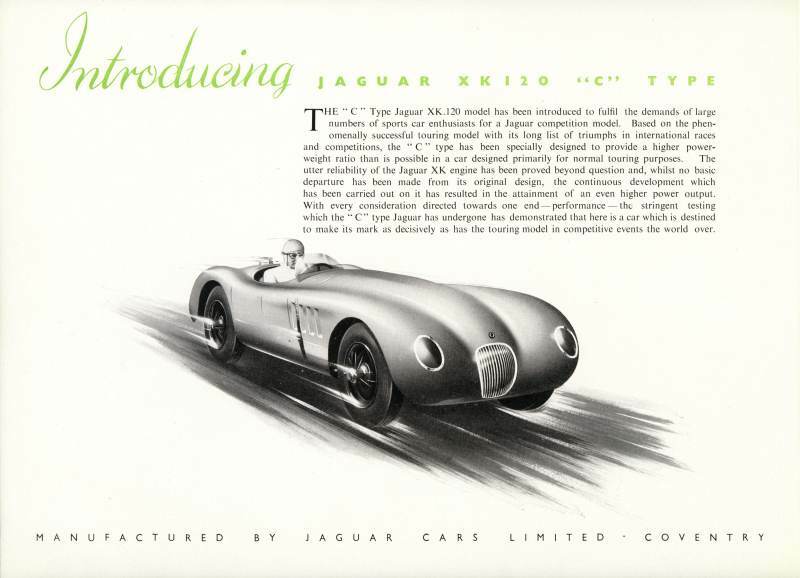 The C-Type was about 1,000 pounds lighter than a stock XK120. 1952 XK120-C (C-Type): Stirling Moss co-drove this car with Norman Dewis in the 1952 Mille Miglia. It was the first endurance test for the new disc brakes on the C-Type and while in the lead. Moss hit a boulder on a mountain road only 123 miles from the finish while in third place. The steering broke and that was the end of the race, but not of the development of what had been proven to be a superior braking system to customary drum brakes! Model by BRUMM 1/43 1952 XK120-C (C-Type): Stirling Moss drove Tommy Wisdoms C-Type (XKC005) to victory in a non-championship race at GP Reims in 1952. It was the first victory for a disc brake equipped car and proived the worth of that new technology. It was a very hot race and at the end of two and a quarter hours of racing, Moss needed help to the podium he was so done in. An epic win for both Moss & Jaguar! Model by JAGUAR MODEL CLUB 1/43 1953 XK120-C (C-Type): Roger Laurent and Charles de Tornaco drove to 9th place in the Ecurie Francorchamps entry at Le Mans in 1953. Jacques Swaters owned the team and he would drive this car again in 1954 at Le Mans with Laurent to 4th place. 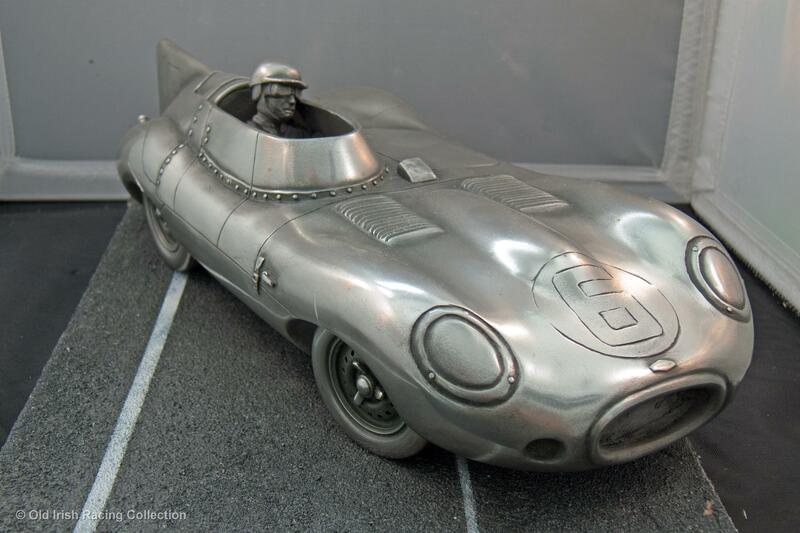 Model by IXO 1/43 XK120-C (C-Type): Even one in pewter! The C-Type was designed and developed for one purpose and that was to race an win Le Mans, a feat it was to do twice, while always being one of Jaguars best of a long line of memorable race cars. If I had to choose one, a C-Type would probably be the Jaguar race car I would most like to own, bags of fun to drive! 1954 D-Type: The D-Type was produced purely for competition. The D-Type used the same 3.4L engine as the C-Type, although it was later increased in capacity to 3.8L. Introducing the monocoque chassis, which not only introduced aircraft-style engineering to competition car design, but also an aeronautical understanding of aerodynamic efficiency. One, if not the most beautiful race cars of all time! This is OVC 501, the factory prototype. Model by AUTOART 1/18 1954 D-Type: Not all D-Types had fins. I made this model years ago as a boy in the 60's to replicate the 1954 Le Mans car of Stirling Moss and Peter Walker (which did have a fin) and unfortunately retired due to brake problems. Building this model is when I probably first got hooked on Jaguars. The rest as they say, is history! 1954 D-Type: Another version of the D-Type raced by Sterling Moss and Peter Walker at Le Mans in 1954. Chassis XKC 403 was sold to Jack Broadhead in 1955 and driven by Bob Berry in races throughout England with good results, until 1957. Model by QUARTZO 1/43 1954 D-Type: Jaguar sold this car to Duncan Hamilton after the 1954 season. It was the first D-type sold to a private customer and Hamilton loved getting the car he drove at Le Mans into his possession. He raced the D-Type in the UK , Europe and Africa through the 1957 season with great success. Model by QUARTZO 1/43 1954 D-Type: Sterling Moss and Peter Walker drove the Jaguar works entry D-Type in the Tourist Trophy at the Dundrod circuit in Northern Ireland in 1954. After Le Mans, this was one of the D-Types first races. It was a disappointing day as brake problems hampered their effort, finishing 14th. This D-Type used a 2.5L engine to try and take advantage of the handicap system for this race. 1954 D-Type: The 1954 Le Mans car driven by Peter Walker and Sterling Moss. It did not finish due to brake problems. Model by HIGH SPEED 1/43 1954 D-Type: The 1954 Le Mans car driven by Tony Rolt and Duncan Hamilton. They very nearly repeated their 1953 Le Mans win, losing to Ferrari. Model by HIGH SPEED 1/43 1954 D-Type: The 1954 Le Mans car driven by Peter Whitehead and Ken Wharton. Their race ended eraly due to gearbox issues. 1954 D-Type: The first Jaguar win with the D-Type came at the Reims 12-Hour race in 1954, with Peter Whitehead and Ken Wharton teaming up to win the 12 hour race in OKV 3 (XKC 404). This car raced in S. Africa into the early 60's. Model by AUTOART 1/12 1954 D-Type: Three D-Types (and one XKSS) left the factory in red. I have read that the original idea was to appeal to the Italian market. One car went to Australia (owned at one time by Bob Jane), one to the USA where it was the 1955 LA Auto Show car (raced by Carroll Shelby at Pebble Beach), and one stayed in the UK (raced and owned at one time by John Coombes. All three still exist and one raced at Goodwood as recently as 2010. Model by JOHN DAY 1/43 1954 D-Type: Crescent made one of the first diecast replicas of the D-Type. They were more authentic than any of the other diecast toys of the era. This model has been repainted. Model by QUARTZO 1/43 1955 D-Type: Bill Spear and Phil Walters retired in the 7th hour at the 1955 Le Mans, driving the Briggs Cunningham team entry (XKD507). After Le Mans, the car was raced in SCCA events in the USA and did very well in the hands of Sherwood Johnson driving for Cunningham and later John Fitch and Walt Hansgen. Model by IXO 1/43 1955 D-Type: This D-Type (XKD 529) was sold to America in 1956, where it was owned by Briggs Cunningham and driven by Walt Hansgen to many wins in SCCA events. Tom Ruthford bought the car and modified it for record setting at Bonneville and he set a long-standing class record of 185.5 mph in August 1960. Model by Brumm 1/43 1955 D-Type: Jaguar brought three cars to Le Mans in 1955, with two heavily works supported customer entries. This D-Type driven by Tony Rolt and Duncan Hamilton was in second place when their gearbox seized in the 16th hour, ending the race for the 1953 Le Mans winners. 1 of 10 models of this car made. 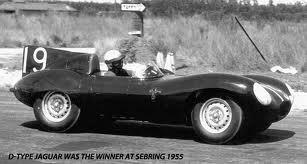 1955 D-Type: The third Jaguar works entry at Le Mans in 1955 was driven by Don Beaumann and Norman Dewis. Dewis was the Jaguar factory test driver and his first race at Le Mans. Beaumann had put the car into the sand at Arnage and had just dug it out when a spinning Lotus hit it and put the D-Type out of the race. Model by SMTS 1/43 1955 D-Type (LE MANS WINNER): This is yet another version of the 1955 Le Mans winner, this time a 1/32 scale slot car. Most of the 1/32 scale cars in the collection are functioning slot cars we race on our track here at Old Irish Racing. Model by AUTOART 1/32 1955 D-Type (LE MANS WINNER): The Hawthorne/Bueb 1955 Le Mans winner. Is that Elvis providing pit support? Model by AUTOART 1/43 1954 Jaguar D-Type (SEBRING WINNER): Mike Hawthorn and Phil Waters drove this Cunningham entry at Sebring in 1955, finishing in 1st place. One of the early D-Types (XKD406), its first race outing was at the Dundrod Circuit in Northern Ireland in 1954, where Stirling Moss and Peter Walker finished 14th in the the 3.4L car. 1955 Jaguar D-Type: The Ecurie Francorchamps D-Type (XKD 503) was driven to a flawless third place finish by Johnny Claes and Jacques Swatters at Le Mans in 1955. One of five factory prepared D-Types to contest Le Mans that year, it was different in that it had 17' wheels, giving it taller gearing. While not as fastas the other D-Types, it was reliable and continued to move up the grid as the race progressed. Le Mans 1956: Ecosse Wins the Day! Model by BRUMM 1/43 1956 D-Type: The Paul Fr�re and Desmond Titterington's race was over by lap three in this car (XKD603). Fr�re spun in esses in heavy rain, on the slick, newly resurfaced track. He was then hit in the rear by the Ferrari of de Portago. Ironically, XKD603 was the spare car, due to Titterington having wrecked the original entry (XKD606) in practice. This pair was a dismal 0-2 with D-Types at Le Mans in 1956. Model by BRUMM 1/43 1956 D-Type: Jack Fairman swerved to avoid the spinning Fr�re in the esses and as a result, his car shared with Ken Wharton (XKD602) made a hasty exit from the race on Lap 3 as well. Ecuire Ecosse ultimately saved the day for Jaguar in 1956, but this would be the last official Jaguar works entry of the D-Type in competition. 1955 D-Type (LE MANS WINNER): The Scottish team Ecurie Ecosse entered their car (XKD501) alongside the factory team entries at Le Mans in 1956. Attrition took the factory team out of the race, but the D-Type of Ron Flockhart and Ninan Sanderson prevailed to take first and a tremendous win for the Ecosse team. Model by SPARK 1/43 1955 D-Type: Not all D-Types were painted BRG and many were repainted by new owners as battle scars were repaired. Two left the factory in a battleship gray color. This one in silver does not represent a specific car, but looks very sharp and could have been a club racer either side of the pond during the mid to late fifties. Model by PROVENCE MOULAGE 1/43 1955 D-Type: One awaiting restoration. One of the nicest diecast models from the period when D-Types were new. Le Mans 1957: 1-2-3-4 Sweep! 1956 D-Type (LE MANS WINNER): Using an ex-works fuel-injected D-type (XKD 606) prepared by Jaguar, Ecurie Ecosse once again finished first at Le Mans in 1957, with the team of Ron Flockhart and Ivor Bueb at the wheel. Jaguar had stopped its factory racing program, but was actively supplying cars and assistance to private teams. It was Jaguar's year, as six D-Types finished in the top seven places. Model by SPARK 1/43 1955 D-Type (LE MANS WINNER): The Ecurie Ecosse winning Jaguar in a larger scale, a factory built K&R Replicas version of the Le Mans winning car. Model by K&R Replicas 1/24 1956 D-Type: Ecurie Ecosse entered a second ex-works D-Type (XKD603) at Le Mans in 1957, with Ninian Sanderson and John 'Jock' Lawrence sharing the driving duties. They finished second to their sister car. This D-Type had the 3.4L DOHC six-cylinder as oppossed to the other team car which had the newer 3.8L engine.The Ecurrie Ecosse 1-2 sweep at Le Mans was Ecurie Ecosse's crowning glory. 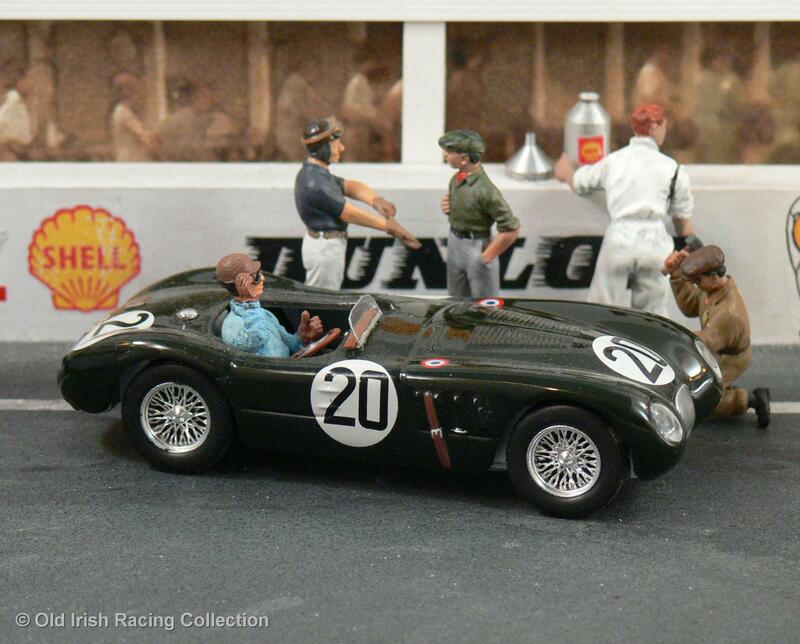 Model by PROVENCE MOULAGE 1/43 1956 D-Type: Ecurie Ecosse continued entering Jaguar D-Types at Le Mans until 1960. However, they never had the same kind of success as they did in 1956 & 1957 at La Sarthe. This car is XKD 603, which finished second at Le Mans in 1957, now with a 3.0L engine. At Le Mans in 1959 in the hands of Innes Ireland and Masten Gregory, it retired after 70 laps. 1955 D-Type: Equipe Nationale Belge entered this car at Le Mans for Belgians Paul Fr�re and Freddy Rousselle in 1957. They finished 4th behind three other D-Types. Fr�re would win at Le Mans in 1960 driving for Ferrari. 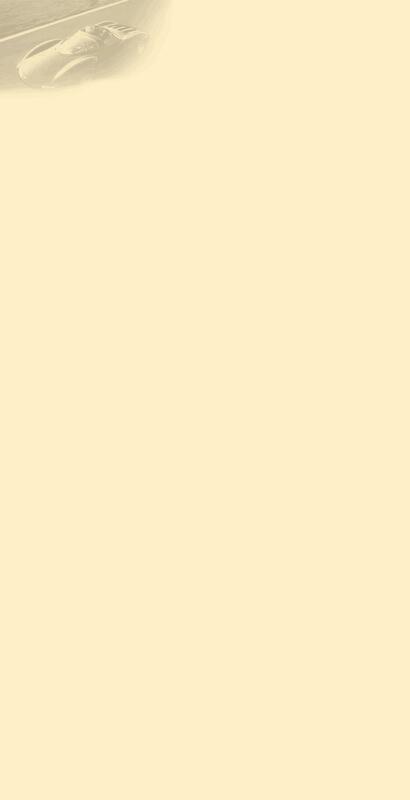 He was later a successful author and journalist. Model by ALTAYA/IXO 1/43 1956 D-Type: Duncan Hamilton bought this 3.8L D-Type (XKD601) from Jaguar to run at Le Mans in 1957. Together with Master Gregory, they proved to be the fastest Jaguar entered, but finished 6th overall. They might have been first had they not lost time over two hours in the pits. Model by PROVENCE MOULAGE 1/43 1955 D-Type: Ecurie Los Amigos was a French team which like most teams fielding D-types at Le Mans, enjoyed factory support, even though Jaguar had ended its official participation. Jean Lucas and Jean-Marie 'Mary' Brussin drove a steady race in XKD513 and finished 3rd overall at Le Mans in 1957. 1955 D-Type: Another version of the Cunningham D-Type from 1955. Cunningham campaigned significant Jaguars beginning with this car, followed by the E2A and then the lightweight E-Types at Le Mans into the early 60's. Model by WESTERN 1/43 1955 D-Type: Ecuire Ecosse entered the same D-Type (XKD 501) they used to win Le Mans in 1956, in the 1957 Mille Miglia driven solo by Ron Flockhart. Unlike at Le Mans, the car did not finish. Model by CARRERA 1/32 1955 D-Type: Another version of the Ecurie Ecosse D-Type raced in the last Mille Miglia. The car had already lived a hard life up to that point and chassis failure on the hard surfaces ended its race at half-way while in 9th place. BRUMM 1/43 1955 D-Type: More sculpture than model, this D-Type is huge and heavy. Something I have wanted for sometime, finally found one reasonabley priced to add to the collection. Hawthorne's Le Mans winning D-Type in pewter. 1955 D-Type: The 1955 Le Mans winning D-Type. Model by SPARK 1/24 1954 D-Type: Model D-Types have been made almost since its introduction. This one is from the 1960's. 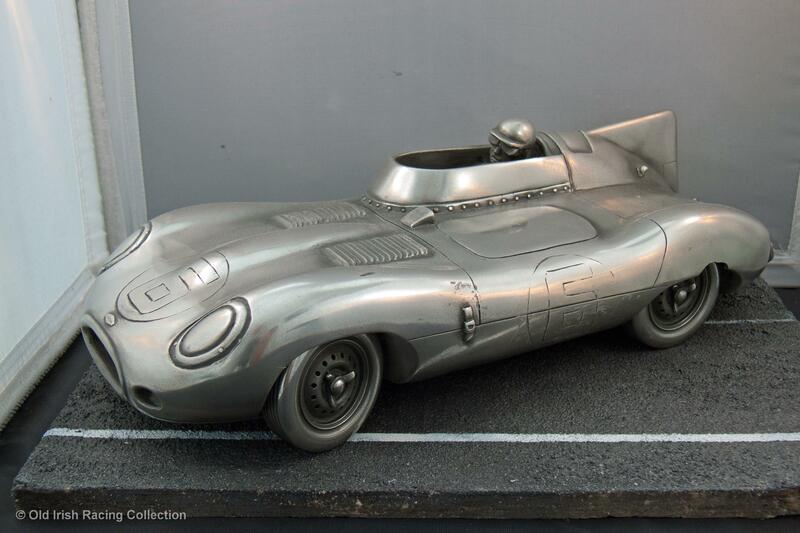 Model by SOLIDO 1/43 1954 D-Type: You can never have too many D-Types! 1954-1957 Jaguar D-Types: 1957 was the high watermark for D-Types. While they continued to race at Le Mans until 1960, they did not achieve the same success and regulations had reduced displacement to 3 liters. In the end, 53 customer D-Types and 18 factory cars had been made before a fire at the factory in 1957 ended further production. Models in various scales 1955 Jaguar D-Type: Welshman Maurice Charles entered his ex-Ecurie Ecosse D-Type (XKD502) he co-drove with John Young at Le Mans in 1958. They failed to finish due to an accident early in the race which left the car in three pieces. Rebuilt, Charles raced the car until at least 1963 with good results and continued the success it had with Ecurie Ecosse. Model by Provence Moulage 1/43 1955 Jaguar D-Type: This was the first mass produced scale model of the 1956 Le Mans winner and this is the first edition of that model. The first edition Brumm's had more cockpit detail. Ecurie Ecosse D-Types were very successful in mid-fifties sports car racing. Aside from Le Mans, other notable wins include the 1955 Ulster Trophy at Dundrod. Model by Brumm 1/43 1955 Jaguar D-Type: Duncan Hamilton and Masten Gregory teamed to drive Hamilton's ex-works D-Type at Le Mans in 1957. The pair finished 6th overall and sixth in classs, Jaguar taking five of the top six spots that year, including the Ecurie Ecosse win. 1956 Jaguar D-Type: I can't resist collecting D-Types, especially if they are well detailed like this slot car version of the '57 Le Mans winner. Model by SCALELECTRIC 1/32 1956 Jaguar D-Type: Briggs Cunningham entered this D-Type (XKD-601) at Sebring in 1956 under Jaguar Distributors of New York. Drivers were Mike Hawthorne and Desmond Titterington, Jaguar factory drivers. Hathorne led Fangio in his Ferrari 860 Monza in the first hour and a close battle ensued for the lead over the first eight hours. With 90 minutes left in the race, after leading or in second place the whole race, the Jaguar was withdrawn as the brakes were spent and Fangio went on to win. The car was raced in 1956 by Jaguar at the Nurburgring 1000 km and Reims 12 Hours (2nd) before being sold to Duncan Hamilton. Model by BRUMM (modified) 1/43 1956 Jaguar D-Type: Like the other Ecurie Ecosse offering by Brumm, this version of the 1957 Le Mans winner has been in my collection since new. Another first edition Brumm. 1951 Mk VII: Extreme altitude, weather and road conditions were part of the challenge of the Carrera PanAmericana, one of the great endurance road races. The 1951 race was run over eight days and covered over 2,100 miles. This Jaguar Mk VII was entered and driven by Fernando Razo Maciel with Luis Solorio as co-driver. Of the 96 starters, only 35 cars finished the race. Sadly this car was not one of them. Model by OXFORD (modified) 1/43 1952 Mk VII: Stirling Moss took time out driving C-Types to drive this big MkVII to victory at Silverstone in 1952. Moss won the International Trophy outright and the class for cars over 3.0 litres. The Big Jags were surprisingly agile for their size and powered by the DOHC 3.4 XK engine, they produced as much horsepower, if not more than their rivals. This power offset the weight handicap and the lack of a good racing suspension. Model by IXO 1/43 1956 Mk VII: Big Jaguar saloons were a popular rally choice. Ronnie Adams and Frank Biggar drove this car to a 1st place victory on the Monte Carlo rally in 1956. Big Jaguar saloons were used with great success on both rallies and in saloon car racing in Britain. The Mk VII used the 3.4L XK engine, producing 190 bhp and despite its size, could produce a top speed of over 100 mph. The big saloons soon lost favor to the compact 2.4 introduced in 1955. 1956 Jaguar XK140 FHC: At Le Mans in 1956, Robert Walshaw and Peter Bolton received factory support for their XK140 entry. Jaguar felt having a near stock production car finishing well would help sales. They were disqualified in the 21st hour for taking on fuel too early while in the top ten positions and leading their class. Model by RECORD 1/43 1958 3.4: The small Jaguar Saloons such as the 2.4 and 3.4 made their way into competition, particularly rallying. With mild factory support, thirty cars were entered by private teams for the Monte Carlo rally in 1958. This car, like the 2.4 in our collection carries numbers from a different car and rallies they did not compete in, this time that of the Paddy Hopkirk Mini which won in 1964. Model by ELIGOR 1/43 1959 Jaguar XK150S: Racing XK150's were rare, but in the hands of some drivers like a young David Hobbs, they were capable GT cars. With the 3.8L DOHC six-cylinder engine pumping out 280 bhp in tuned versions, its disc brakes gave it additional advantage over other competition whose brakes would begin fading long before the race ended. Ecurie Ecosse Commer Transporter: In 1959, Ecurie Ecosse commissioned this transporter to be built to haul their cars from race to race. Too late for D-Types they raced in the mid-50's, it would have hauled the teams Tojeiro-Jaguar, AH Sprite and Cooper Monaco. The popularity of this transporter was surely elevated by the introduction of this famous model in 1961. Ecurie Ecosse Commer Transporter: Ecurie Ecosse did use the transporter to carry the last D-Type to race at Le Mans in 1960. At the time, it was considered to be a state of the art transport for three team cars, with crew quarters, work area and stores. It survives and is used regularly at vintage racing events in the UK and the owners collection of Ecurie Ecosse cars. 1956 Cooper Jaguar T38 MkII:Powered by a 3.4L Jaguar DOHC six-cylinder engine, with dry-sump lubrication, producing 250hp, the T38 MkII was a continuation of the successful T33. Head entered the car in minor and national events, and usually won against similar displacement competition. This car was owned by Michael Head and is Chassis #CJ-2-55. Three MkII T38 cars were constructed. Shown here is the car as it won the BARC Goodwood race in 1956. Model by JADE 1/43 1957 Lister Jaguar TS1:More Jaguar looking than other Lister Jaguar powered cars, this car was owned by Bruce Halford and was co-driven by Brian Naylor at Le Mans in 1958. The pair finished 15th over-all. Powered by the 3.0L version of the XK six-cylinder DOHC engine which conformed with the rules in 1958, the 3.0L engine was never as reliable as the other XK engine variants of larger displacements. Model by HISTORIC SPORTS RACER 1/43 1958 Lister Jaguar 'Knobbly': In 1957, using D-Type specification engines, Brian Lister began using Jaguar power in his aluminium bodied sports cars. With Jaguar no longer racing, the Listers kept the marque name on the podium and out performed rival Aston Martin. This car was raced at the GP Silverstone by Walt Hansgen and DNF'd, the sister car driven by Stirling Moss won. 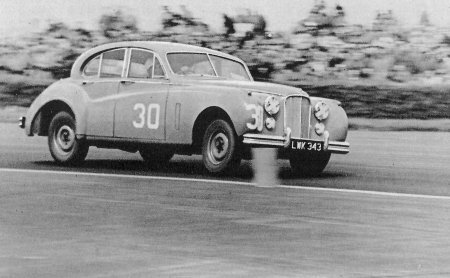 Lister Cars withdrew from competition at the end of the 1959 season. 1958 Lister Jaguar 'Knobbly': Ecurie Ecosse acquired a Lister Jaguar to campaign in the 1958 season in non-endurance races, employing Masten Gregory to do the driving. The American took to the Lister and was able to compete head to head with Archie Scott Brown, the Lister works driver. Gregory won at Spa in 1958, sadly in the race Scott Brown lost his life and racing lost one of its true heroes. Model by WESTERN MODELS 1/43 1959 Lister Jaguar Costin: Brian Lister commissioned aerodynamics expert Frank Costin to create a slippery body capable of higher speeds. This car was entered by Briggs Cunningham in the 1959 Sebring 12 Hours for Ivor Bueb and Stirling Moss. Unfortunately after qualifying 2nd, they were disqualified due to illegal refueling during the race. The car was entered for Walt Hansgen in the SCCA C-Modified National Championship, which he won. Model by PINKO 1/43 1959 Tojeiro-Jaguar: John (Toj) Tojeiro was a brilliant engineer and racing car designer, whose innovations helped to revolutionize race car design. Toj built the first of four Tojeiro-Jaguar's in 1956 in collaberation with Ecurie Ecosse. This is the fourth car which was designed to compete at Le Mans in 1959 where it retired. In its second race at the Goodwood TT, it was driven by a young Jim Clark and was crashed by co-driver Masten Gregory. For the TT, the car here was powered by a 3.8L Jaguar six-cylinder with fuel injection. 1958 Lister Jaguar 'Knobbly': Driven by Ed Crawford and Walt Hansgen at Sebring in 1958 , this Lister (Ch. 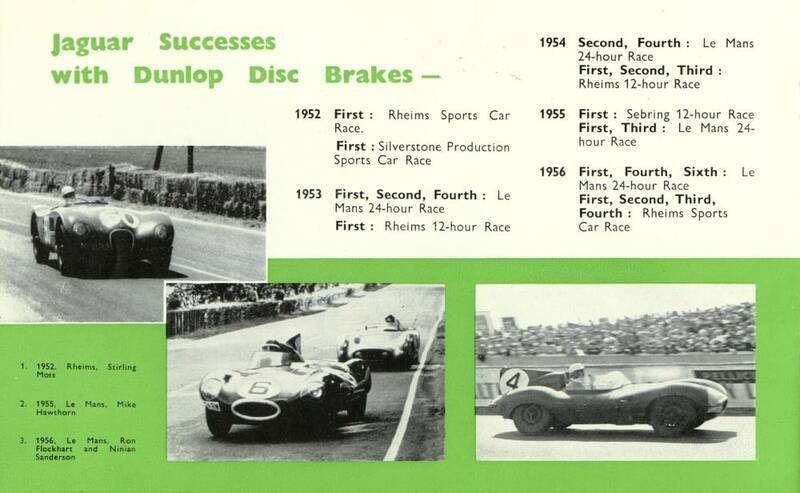 #BHL102) was one of two entered by Alfred Momo for Briggs Cunningham along with a Jaguar D-Type in the 12 hour race. Both Listers failed to finish, this car retiring with a cracked block, the other an accident. All three cars used the ill-fated 3.0L version of the Jaguar XK six-cylinder engine, which complied with new World Sportscar Championship regulations. The car was raced successfully by Cunningham in SCCA races until 1960. It also was campaigned in the Watkins Glen and Road America endurance events, often with Briggs Cunningham at the wheel. I was fortunate to get to see this car at Road America in the fall of 2013, fifty-three years after it last raced there, one of the first two Lister Knobblys made.